Seven years ago, when I first heard of square knitting needles I thought it was a fad and surely wouldn't last. Of course, they are still around and as relevant as ever and so when the opportunity to test Knitter's Pride newest Nova Cubics Platina arose, I knew it was beyond time to get on board. Knitters are probably more particular about their needles than any other tool because of the intimate relationship the needles have with the process and product. The material the needle is made of and shape of the tip is just as important to the way the stitches are formed as the gauge. Square needles throw a wrench into the whole thing because there is an added element to the mix beyond material and point. Most claims I've come across state that the shape is more ergonomic, reducing joint stress and fatigue and that the unique shape creates more even stitches. Because I've never used any square needles, I wanted to invest some time in this review and really see not just what the new Nova Cubics Platina were all about, but perhaps have a deeper understanding of this style of needle in general and how it can improve our knitting - both in process and product. The needles themselves are positively gorgeous, shiny and smooth - you could wear them as jewelry! The packaging boasts "Longer & Pointier Tips". The points do in fact have a very long taper to a nice point that isn't too sharp. 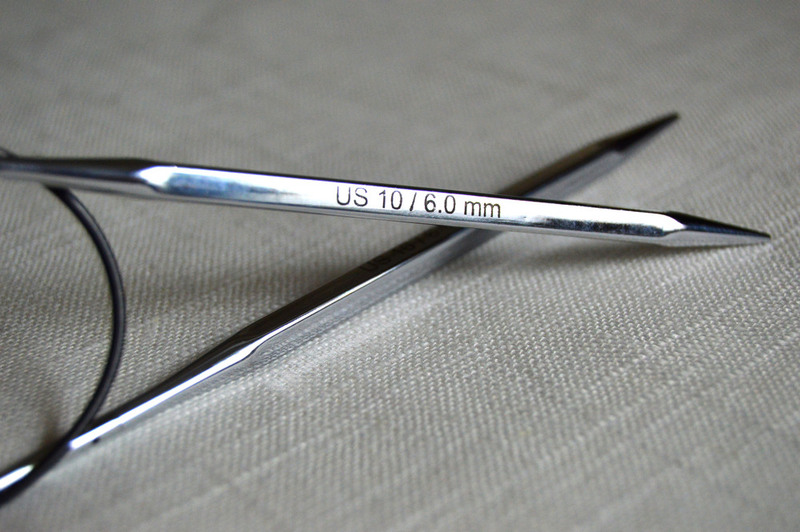 I prefer a slightly rounded tip since I occasionally use my index finger to slide my needle back through my stitches and points that are very sharp are uncomfortable for me to use for any length of time. US and metric sizes are printed clearly on each point which is a huge benefit for someone like me who is no stranger to tossing points into a notion bag in haste. I double-checked the needles using my needle gauge and noticed there is space along the flat sides of the needles, meaning the needles measure at the printed size along the four corners. I have heard through the knitting grapevine that using square needles affects gauge for many and I'm wondering if this is the culprit. This doesn't concern me much, but I will be double-checking my gauge after completing the swatches looking for variations. In addition to the 7 pairs of needle points, the kit includes 4 cords, end caps, cord keys, and most interestingly, 3 cord connectors. You see, I've recently begun researching different methods for knitting from the center out for shawls and blankets. This is something I think is going to become a movement of sorts and in my first trial (a triangular shawl knit from the center), there was one thing I needed to make it the size I wanted - cord connectors! And did I have any? No. Did my LYS have any? No. The fact that they're right here, included in this kit, is fantastic. So wait, what are they and why did I need them? They are small cylindrical pieces with a female connection on each end that will fit the male connection cords. This is a genius little piece of hardware because you can connect any length cords together making one long cord. I needed it for my center-out shawl because even though I could find a cord as long as 60", it was not nearly long enough to accommodate my stitches toward the outer edges and I needed to attach another 32" cord to make it work. In the end, I frogged the piece and stored my sketches to come back to. It looks like I'll be getting back to that concept sooner than later thanks to this kit! It should be noted that before getting started, I was concerned that the edges along the needle barrel would be a nuisance and might press into my thumbs as I knit and so I was very aware of how the needles felt in my hands as I worked. I selected three very different yarns to swatch - each I've used in the past and so I have a good idea of how they handle. The first is a neat, round yarn that is a nice, springy, wool blend. I used the recommended size US7 needles to achieve 18 st / 4" gauge. I tend to knit exactly on gauge and so I wanted to see if my gauge would differ using the square needles as opposed to comparable round needles. The second is a round yarn made up of many plied strands. It is a bamboo and cotton blend with no spring and has proved problematic for me in the past. Though I've always knit with very even tension, I worked a sample in this yarn and could clearly see variations in tension throughout the piece. I used size US6 needles which are a size above recommended because my previous experience with this yarn is that US5 creates a fabric more dense than I prefer. The third and final yarn is a very loose, silky single ply yarn with no spring. This was another sort of problem child yarn that split like crazy when I swatched with it for a project long ago and decided it was more trouble than it was worth. The points connect to the cords easily and as I knit I'm not forced to tighten them every few rows as I've experienced in the past with interchangeable needles. I knit primarily with wood needles, but metal needles are a close second for me. I prefer a smooth, even slippery needle and am very pleased with the feel of the stitches and how easily they glide on the Nova Cubics Platina. As mentioned above, I am acutely aware of the barrel feel in my hands and am pleasantly surprised to find the edges are slightly rounded. It took a few rows for me to find my rhythm because each time I felt the edge of the needle, I really felt it. It's hard to explain the sensation exactly, but I could best compare it to driving in a construction site and you go over the ridged patches - your car doesn't handle differently, but you're attention is instantly grabbed as you go from smooth to ridged pavement. By my second swatch, I'm no longer being distracted by the edge and I relax into letting the needles do the work. It's Day 2 and my swatches are dry! The first swatch knit up quickly in the round, wool blend yarn and as I became more comfortable with the feel of the needles I could really begin to enjoy the smooth finish and that long point. The second swatch knit up just as easily as the first and I was surprised at how even the stitches were compared to results I've had in the past - and the yarn never split once! Going up a needle size was still appropriate as I had expected. I chose two yarns that were prone to splitting because very sharp points often exasperate the problem and I wanted to see how the Nova's new point preformed. I think the added space between the flat edge of the needle and the underside of the stitch allows a nice flow and gives the needles room to work. The same can be said for the third swatch - the stitches are more even than I've been able to achieve with this yarn in the past and it never once split. 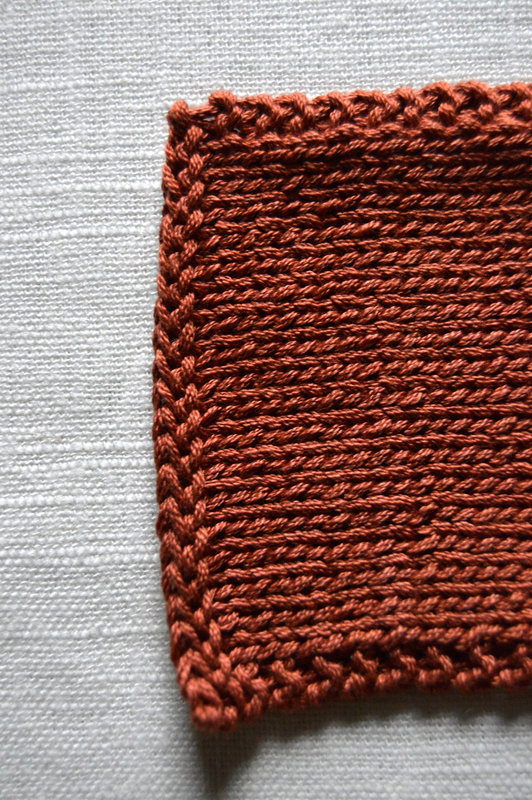 So, how did my first swatch compare in gauge to what I normally achieve with this yarn and comparable round needles? 20 sts / 4"gauge! I wonder if this will change over time as I use them more often, but this was actually the most shocking finding for me and it brings up a couple of other questions - what circumstances make this trait and asset and are there any down-sides? Most obviously, I would say anyone who is a chronically loose knitter would benefit greatly from just tossing out every other needle in their possession and switching to these Nova Cubics. But a possible downside: What if you're a tight knitter? Would these needles just make already tight stitches worse? I don't know! That's a question that deserves some research, but something tells me it wouldn't be as much of an issue as it may seem... that smooth edge on the barrel of the needle begs for a delicate hand. Even though the edges are rounded and didn't bother me once I got used to the feel, they also do not encourage a tight grip. This may also be a contributing factor in the claims that they reduce joint pain and fatigue. I sometimes find myself holding on to my needles like they're going to get away from me - but not with the Cubics. And so, in the end I feel like Knitter's Pride is really on to something with these. For a square needle, the Nova Cubics Platina are a very well-rounded tool, and a pleasure to work with.